The Historical Group of the city of Corinaldo was born in 1980 with the Drummers Group, to dramatize the re-enactment of the Contesa del Pozzo della Polenta (Contest of the Polenta Well) of Corinaldo. In later years, the Heralds, the Archers and the Flag Twirlers Groups were added. Thanks to several decades of activity, and to participation in presentations and historical evocations in all of Italy and in many European cities, the Historical Group of Corinaldo has always been distinguished and praised for its exhibitions. the Drummers and the Heralds recreate the long cadenced marches of armies in battle, following a complex and spectacular choreography; the Flag Throwers, with their narrative exhibitions, ring to life the 17th century flag handling manuals; the Archers give scenographic demonstrations of flights of arrows using flaming arrows or explosive darts. 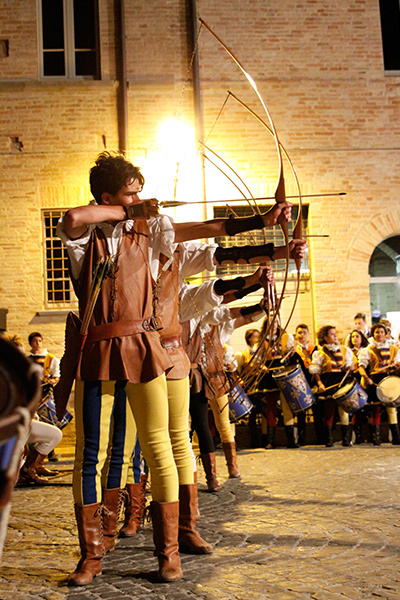 The Archers Group has been part of the the Historical Group of Corinaldo since the early 1980s. 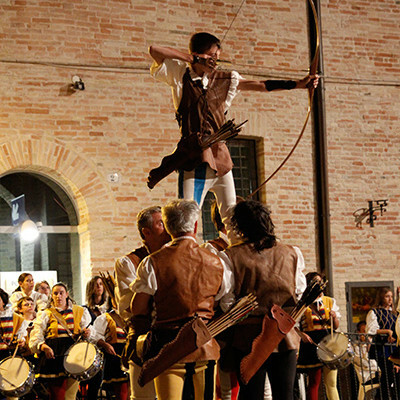 The archers perform during Corinaldo’s historical re-enactment, the Contesa del Pozzo della Polenta (Contest of the Polenta Well), which takes place every year during the third week of July. 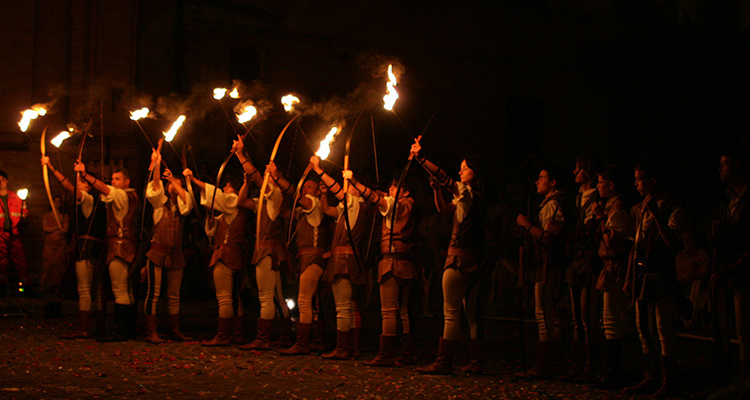 The Archers Group was established with the purpose of promoting, in Italy and in other countries, the knowledge of medieval culture, organizing competitions, tournaments and exhibitions using historic bows, and through demonstrations of skill, bringing to life a bit of the Middle Ages in the streets and town squares. 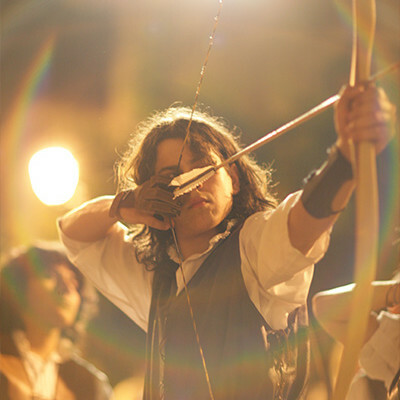 The show alludes to the skill of the late Middle Ages and the early Renaissance, before firearms superseded the bow, which wasn’t a means of entertainment or exhibition, but a deadly weapon, used by a specific division of the army to attack the enemy and to defend against attack; in times of peace, it was used to hunt wild animals for survival. The bow is formed of laminated pieces of elm and yew, with a long flat arch. The front part has to resist compression and the back part has to resist traction. 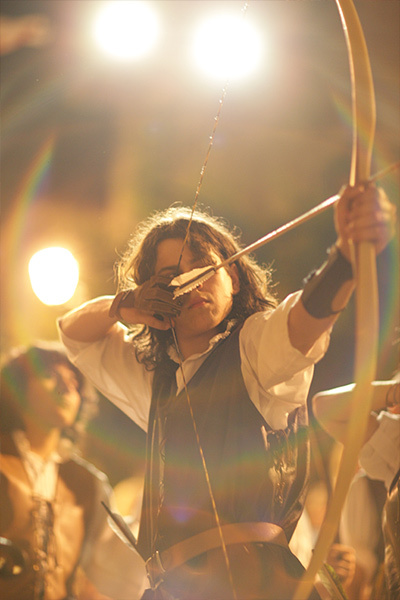 This is a particular characteristic of the medieval bow. The string of the bow is a thread which is twisted from 20 to 25 times, depending on the desired power of the shot, while the arrow is made of cedar wood, with a brass point; three natural goose feathers are attaching to the rear end, which determine the stability and the trim. The spectacles of the Archers Group are always accompanied by the sound of the Heralds’ trumpets and the beating and rolls of the Drummers. The components of the groups are divided according to the four quarters of Corinaldo: Historical Center, New Gate, Market Gate, and St. John’s Gate. 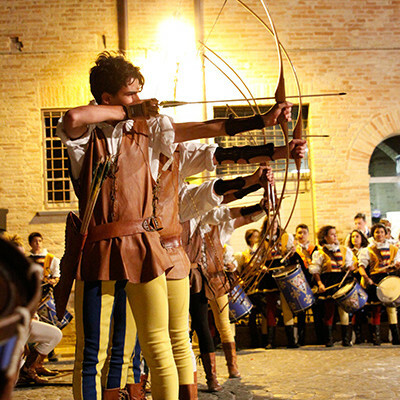 During the Contesa del Pozzo della Polenta, the group competes in the Archery competition, and the winning quarter participates in the procession of the Duke in the following year. The continual perfection of the technique of firing and of the materials used enables the improvement of the archers’ skill and of their ability to hit fixed or moving targets with arrows that travel at the speed of 110 to 130 kilometers per hour (130-210 mph), without the use of precision sights or balances. The Archers Group performs these days in competitions such as classic target shooting, shooting at moving disks which release confetti when struck, shooting at coloured rings, shooting at hidden disks, shooting at disks on human towers, and so forth. The targets are placed at distances from 18 to 20 meters (60 to 65 feet). During night exhibitions, the archers perform suggestive shots of flaming arrows and explosive darts that ignite spectacular fireworks displays. 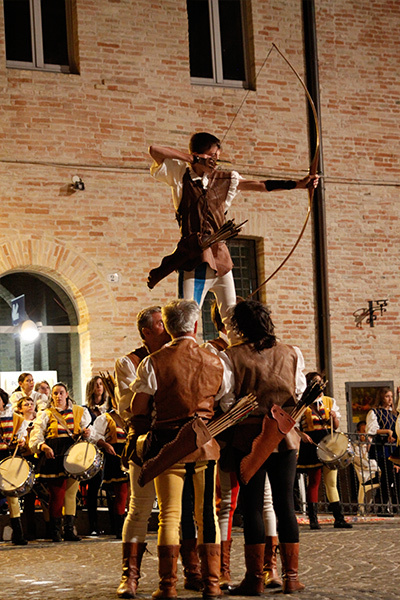 The Drummers Group, part of the Historical Group of Corinaldo, was established at the beginning of the 1980s. They perform in historical costumes of the high Renaissance, accompanying historical processions or giving exhibitions on request. 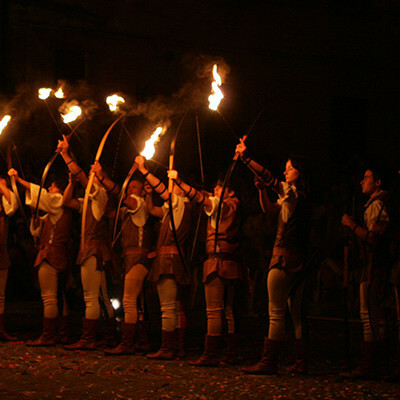 They have performed in many piazzas of Le Marche, as well as in other Italian cities, such as Florence, Bologna, Neptune, Bergamo and Prato, as well as in foreign cities, such as Budapest, Lorrach, Fussen and Reutte, confirming the popularity they enjoy and the success they achieve in every season of the year. While in the early years the group’s role was focussed on leading historical processions, marking their steps with its cadenced rhythms, in recent years it has made notable progress. In addition to its rigorously historical exhibitions, it also presents true spectacles lasting around 30 minutes. The group can present stories, deeds, and literary re-enactments from the medieval and renaissance periods with choreography and scenography entirely accompanied by the rhythm of the drums! These days the beat of the drums and the fast rhythm of the drum rolls have an indisputable scenographic impact and give an indispensable resonance to the drills of the Flag Twirlers and emphasize the figures and the stunts to greater effect. Every year, during the Contesa del Pozzo della Polenta (Contest of the Polenta Well), the Drummers Group presents the preview of a new show that attracts the attention of young and old, arousing great emotion among the spectators. The background of music underlines the various phases of the show, enriched with suggestive lighting and torches, and also with pyrotechnic effects. The Heralds Group, after a brief existence in the early 1980s, was re-established in 1991 and officially became part of the Historical Group of Corinaldo. All of the members of the group have a solid musical preparation, essential for playing this historical instrument, the herald’s trumpet. Their unmistakable brilliant sound evokes perfectly the typical medieval and renaissance atmosphere that fascinates and enchants spectators. In ancient times, this instrument, without slides, or with slides to allow a broader melodic range, was used during battles to enhance the ferocity of the attackers and to incite the armies during their advances, or to communicate the orders of the generals. In times of peace, it was used to announce the beginning of festivals, competitions, and banquets, to announce the arrival of kings and dignitaries and other illustrious persons, and, accompanied usually by vigourous and rhythmic drum rolls, it was sounded to call attention to cries, proclamations and orders. The members of the Heralds Group dress in sumptuous garments made to a unique pattern based on 16th century paintings, as do all the other members of the Historical Group. The Heralds of Corinaldo, preferably together with the Drummers, are available to participate in historic processions, historical re-enactments and any other exhibition that seeks to recreate the atmosphere of the 15th and 16th centuries. Their sound also is well suited to accompany the exhibitions of the Flag Twirlers and the Archers and to emphasize their most spectacular feats. In addition, for some years the group has developed, together with the Drummers, fascinating spectacles for town squares and plazas. The brilliant notes of the trumpets and the powerful rolling of the drums, together with complex choreography and the use of lights, music and pyrotechnics, the use of swords and flaming chains, are used to narrate sieges and battles, heroic deeds and valorous combats, myths and legends, leaving spectators of all ages fascinated and enchanted. Their shows satisfy, at least in part, the need of all of us to dream and relive the charming and unforgettable epochs of the Middle Ages and Renaissance. The Company of the Flag Manipulators was established in February 1994, as part of the historical activity of the Association Pozzo della Polenta (Polenta Well). The flag twirlers derive from a rigorously historical figure based on the recovery of ancient manuals of flag handling published in Italy as works of the great masters of arms of the 17th century. From these are derived exhibitions exactly timed to the rhythms of the Drummers and the trumpets of the Heralds, perfectly coordinated to the precision of the launches of the flags and the movements of the twirlers. To these are associated a plastic narrative, where plays of lights and music make an expressive background to transform the “play of the flags” into a vehicle for expressing emotions and sensations tied to fundamental themes of the human spirit. This allows the Company to perform in town squares and plazas, narrating stories and legends from medieval literature with choreography entirely based on the expressive use of the flags. At this point, the spectacle becomes, either in a procession in the streets or in a theatre, an exhibition of colours, force and bravura that astounds and mesmerizes the audience, causing them to erupt in a natural explosion of enthusiasm at the end of the performance to show their approval.